Hi Grant. My first amp build was a Lamington. No experience, no skills and just a circuit diagram to work from. I’m now very much hoooked on tweaking/fixing/building amps. Thanks (I think). Where in the signal chain of the lamington amp would you put the lamington reverb? As an effect prior to the amp? After the first gain stage? Where would you suggest? Cheers. Hi Jeff, really great to hear you have successfully built a Lamington amp. With regards to my Lamington reverb, it is designed to be connected to the front of an amp, as a Fender 6G15 or an effect pedal. Hi Grant. 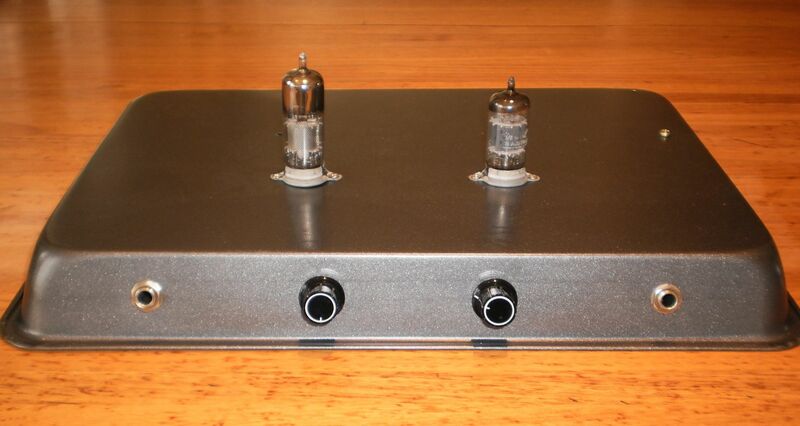 Have no much experiences with tube amps building (just a few mods) but this looks like very nice project for the beginners. Is there any easy way to add footswitch to this circuit? Thanks for your interest in the Lamington Reverb. Yes, it is quite easy to add a footswitch to the circuit. Just add the switch between the reverb return output (ie pin 7 of V1b) and ground. Have fun! Thank you for the great project. Reverb was sucessfully build and I still really like it. Do you think it is possible to use two reverb tanks and to switch between them when play? My first reverb tank was MOD 8EB2C1B. Sound was perfect but wanted longer decay, so I bought MOD 9EB3C1B (both have 3 springs). Now Im satisfied (at least for more surf stuff) but sometime miss the sound of shorter one. There was something in the sound which cannot be simulated just by turning the knobs. Hi Radim, great to hear you are enjoying your Lamington Reverb unit. Re switching between tanks, it could be achieved by using a double pole double throw (DPDT) switch. The middle (wiper) contacts would be connected to C4 for one half of the switch and pin 7 of V1b for the other half. You would then connect the “hot” leads of each reverb tank to the outside contacts of the switch. The switch would then select between the tanks. Hope that helps! I observe that there is mains isolation through the psu and toroidal step up transformer. 1. The circuit diagram references ‘chassis earth’ but there is no earth connection on your diagram. Please elaborate. 2. Would you please explain how safety is maintained (a failed solder joint could expose 300+VDC to the chassis and hence the guitar and player in the absence of any other earth). 3. Would you also provide details of the source of your 12VAC PSU with an earth pin? I am 90% through this build and need to be sure it is safe. Thanks. Hi, yes my design provides mains isolation via the 12V plugpack. This means that the chassis of the reverb unit is isolated from the mains, but as you say is not earthed. Typically, when used with an amplifier, the signal earth of the reverb is connected to the amplifier earth. Either way, the reverb unit is safely removed from the mains. Hi, I’ve been looking at your stand alone Reverb. I’ve already built your valve tester. Just a query or two. 1. Why the power pack and then the step up back to 240v, why not just go with 240v supply and a small step down to 12v for the heaters? 2. I know that the pin outs are different, but the EL84 is more readily available than the 6BX6, any reasons for not using this? Great to hear you have built my valve tester. Re the Lamington Reverb, I assume you mean connecting the unit directly to the mains 240V? If so, that is not a proposition for safety reasons. There would be no isolation between the reverb and the 240V mains meaning that there is a real risk of the mains lead being reversed making the chassis live. The plugpack used in the Lamington Reverb provides full isolation for the circuitry. Re the choice of 6BX6 for the tank drive valve, I used it as it has a much reduced heater current requirement than an EL84. 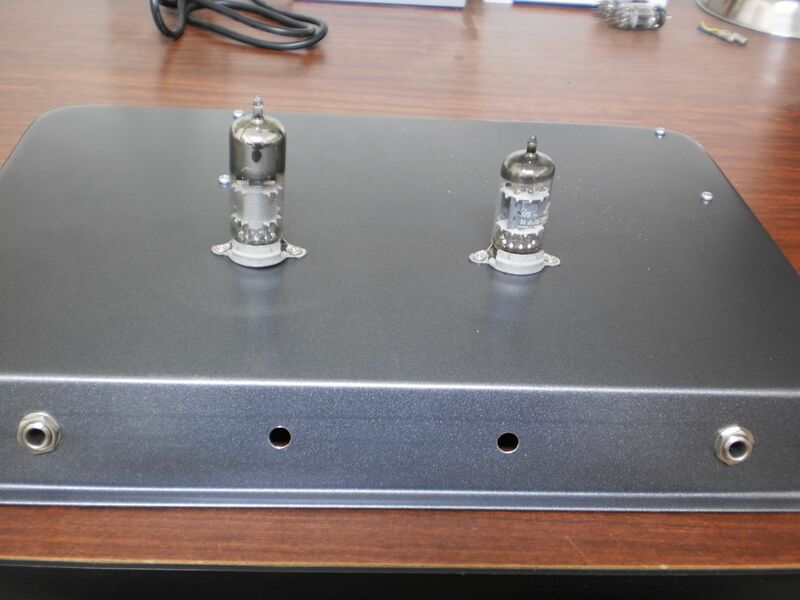 There are a heap of valves that can be used in place of the 6BX6 and they are listed in the description. If you get stuck, let me know and I can send you one for the cost of postage. Cheers! Would an EF86 work well as a drive tube? I also have a few EF36 valves that I’d like to try! Hi Thanks! Think Ive got an old Telefunken 6au6 that I’m going to try. Great reverb design. I have built this but I used a tube town toroidal that is providing both the HT voltage as well as heater voltage (6.3V) eliminating the plug pack/step up combo. My problem is the reverb has quite a pronounced hum when I blend in the reverb, full dry the hum is gone. I’ve implemented a hum loop block circuit for the signal grounds but that hasn’t helped, as well as elevated the heater tap onto the cathode of the the 6BX6. Also played around with reverb tank position but that hasn’t helped either. It’s a low frequency hum. Also chopsticked various signal and power wires to no avail so I’m stumped, any ideas? I’m guessing maybe something to do with heater wires, I noticed in your schematic that they are running off of a 12V arrangement where as mine are coming from 6.3V off the toroidal. Any ideas/help would be appreciated, this reverb has a lovely tone besides the hum problems. Using a graphic EQ to target frequencies, a lot of the hum is reduced when I cut at 100Hz but that is the lowest the EQ goes down. I will say that I am using a tank with an output of around 600ohm versus the 2500ohm of the suggested tank so not sure if that is causing issues? Losing a lot of general volume when I use the reverb unit versus plugged straight into the amp too but not sure if that is normal behaviour. Hi Dale – Hmmmm….hard to say if that is mains hum or power supply hum. The tank is fine with a 600ohm input impedance. There should not be a significant reduction in volume if the reverb is bypassed – I suggest you recheck your wiring – perhaps the hum issue is related to the volume drop? Cheers. Thank you so much for the schematics this looks awesome. I’m building one right now, and if i didn’t just get a nice little tube amp (without a reverb tank) i’d be building a Lamington amp to go with it. I’m wondering what you thought about putting an SPDT switch just where the input comes in creating the option to “true bypass” to just before the output, in the form of a stomp toggle. Obviously I won’t be smashing my biscuit tin version and i never stomp my stomp boxes anyway but yeah, can you think of any reason why this wouldn’t work or would be a bad idea? Thanks for your kind comments. 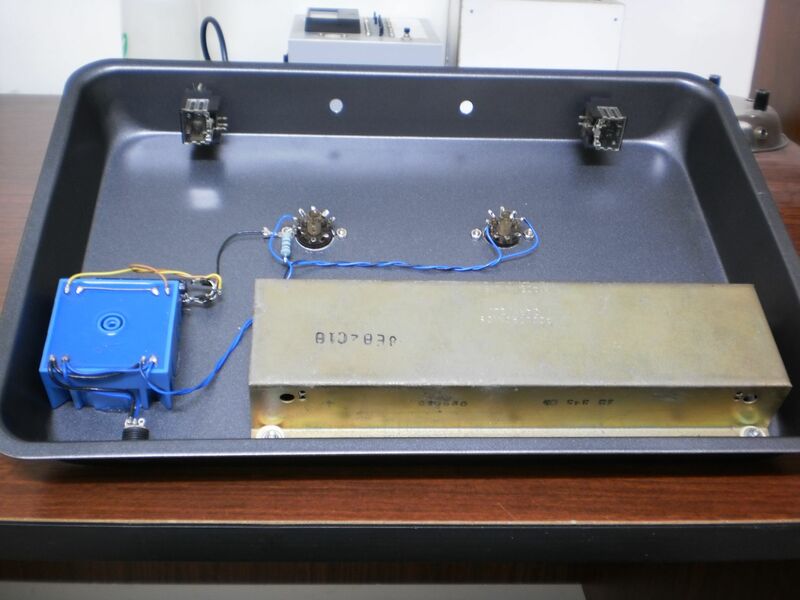 Yes, you can add a true bypass to the reverb, and another option is to add a SPST switch across the reverb tank output – this is how Fender amps switch the reverb in and out. Have fun! Thank you for your prompt reply. Sorry but I’ve got some noob questions. This is the first audio-related circuit I’ve ever made, having made coil/Gaussian guns in high school from disposable camera flash circuits and other than that only high school physics pracs. I assume the ground from capacitor 8 is also going to the chassis, or is it going to signal ground? Is the signal ground essentially a line from the input ground and the output ground with all those signal grounds (like from capacitor 3, and resistor 3) connected to that line? Nice build, I like the idea of using both signals from plate and cathode of the first stage. I am doing something similar but with a bigger input impedance reverb tank and a 6DX8 as a driver and recovery. I wonder if you have noticed any “phaser effect” as it seems signals are out of phase when they are mixed in the output pot. Hi Niquel, yes there is a real advantage to using a pentode as a current source to drive the tank. There were no phase issues with the prototype as reverb by nature involves random phase additions and cancellations meaning that it does not matter how the reverb signal is mixed with the dry signal. Hello, Some one is helping me build it as i have no idea.. but i have a gibbs tank that is 4AA1C1C which input is 8 ohm and output is 500ohm.. are we able to use this tank? Hi Wayne, the 4AA1C1C tank is a low impedance tank with those specs. My design requires a 600-800 ohm input impedance and approximately a 2275 ohm output impedance. Thanks so much for clarification. Any suggestions what we can build with this tank any links to plans that would suit please? Thanks so much for helping. 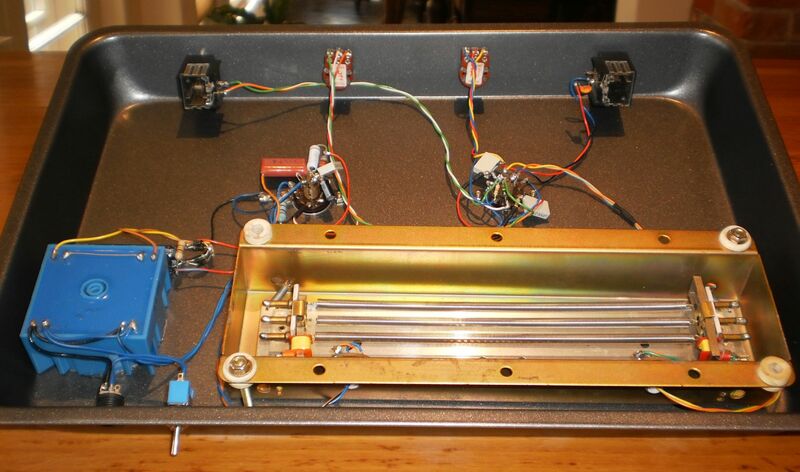 Hi Grant, Fender reverb circuits generally couple the drive tube to the tank with a transformer. I’m wondering why you chose a capacitor instead? Hi Larry, the rationale to use a directly driven high impedance tank with a pentode is discussed in the project description. Hello Grant. I built this and it works great. However there is a buzz which increases when I turn up the volume with the reverb engaged. There is no buzz when just the dry signal passes through. What would cause this? Thank you. Hi Issac, a couple of things you might look at. If the noise decreases when the tank is moved, you will need to re-orient it. Also, make sure that the junction of the two valve heaters is grounded. In the photo there appears to be a resistor attached to the heater lead. Should I be adding this to my circuit and at which rating? You have a good eye! The prototype did use a resistor in the heater circuit to drop a couple of volts as I used a 14V plugpack. If you use a 12V plugpack, no resistor is required.